Revolutionize your seated workouts with the highly-durable Octane Fitness xR6000 and Octane Fitness xR650 Recumbent Elliptical Machines. Featuring Octane’s exclusive 16” Power Stroke technology, the xR6000 and xR650 Recumbent Ellipticals facilitate optimal leg extension, activate up to 3x more muscles and burn up to 23% more calories than a recumbent exercise bike – providing a super effective workout while seated without the jarring impact typically associated with many types of exercise. Both the Octane Fitness xR6000 and xR650 Recumbent Ellipticals are sturdily constructed and suitable for intensive use, with the xR6000 considered to be full commercial quality and the xR650 suitable for light commercial use. The Octane xR650 is self-powered so you can place it anywhere you have the space without having to worry about it being near a power socket. The xR6000 can be supplied with the option of either electric-powered with a Smart Console or self-powered with a Standard Console. Suitable for both beginners and advanced athletes, the Octane xR6000 and xR650 Recumbent Elliptical Trainers have a great range of features to suit everyone, no matter what your fitness level. Start off and progress at your own pace with the Octane xR6000 and xR650’s 30 resistance levels and wide range of programs that will keep you motivated and progressively challenged. 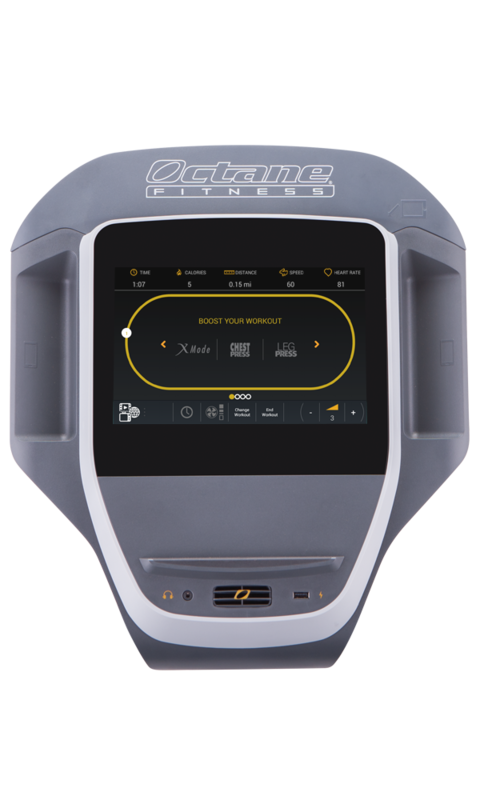 The Octane Fitness xR6000 offers 17 built-in programs on the Smart Console (electric-powered) or 14 if you opt for the Standard console (self-powered). 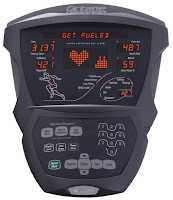 Programs on the xR6000 include Manual, Random, Interval, Hill, Distance Goal, Calories Goal, Fat Burn, Heart-rate Interval, Heart-rate Hill, Heart-rate Speed Interval, Constant Watts, Constant METs, 30:30 Interval, and MMA (Mixed Martial Arts). 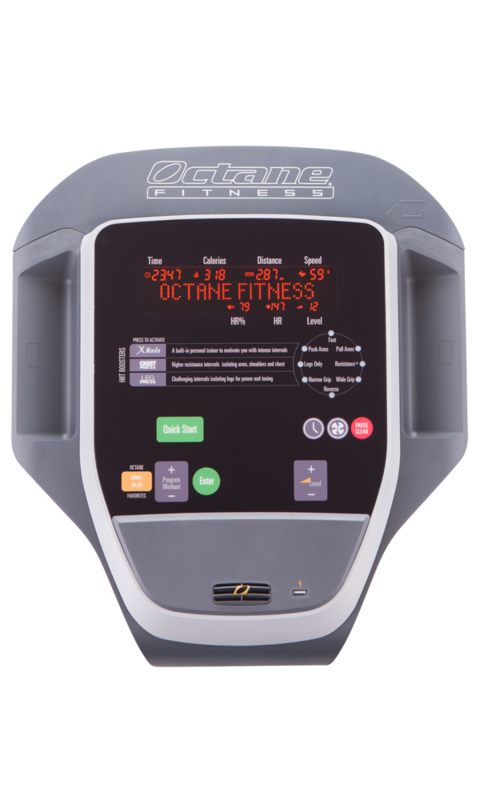 The Octane Fitness xR650 offers 16 built-in programs including Manual, Random, Interval, Custom Interval, Hill, 10K, Fat Burn, Cardio, Heart-rate Interval, Heart-rate Custom Interval, Heart-rate Hill, Heart-rate Speed Interval, New Leaf Custom, 30:30 Interval, Constant Watts, and Constant METs. 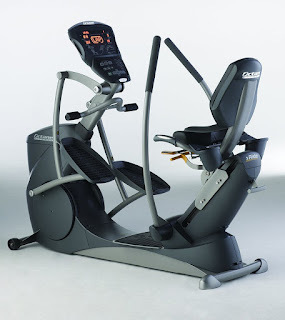 In addition to the Octane xR6000 and xR650’s workout programs, both recumbent elliptical machines also feature Workout Boosters that combine cross training with strength training for improved results. Both the xR6000 and xR650 feature Octane’s Leg Press booster (challenging intervals to tone your legs) and Chest Press booster (focused intervals for toning your arms, shoulders and chest). The xR6000 also features Octane’s X-Mode booster (random intervals) while the xR650 features Octane’s Muscle Endurance booster (muscular endurance training). The Octane Fitness xR6000 and xR650 Recumbent Ellipticals both offer contact pulse (sensors in handles by side of seat) and telemetry heart-rate monitoring to help you stay within your target heart-rate zone as you exercise. 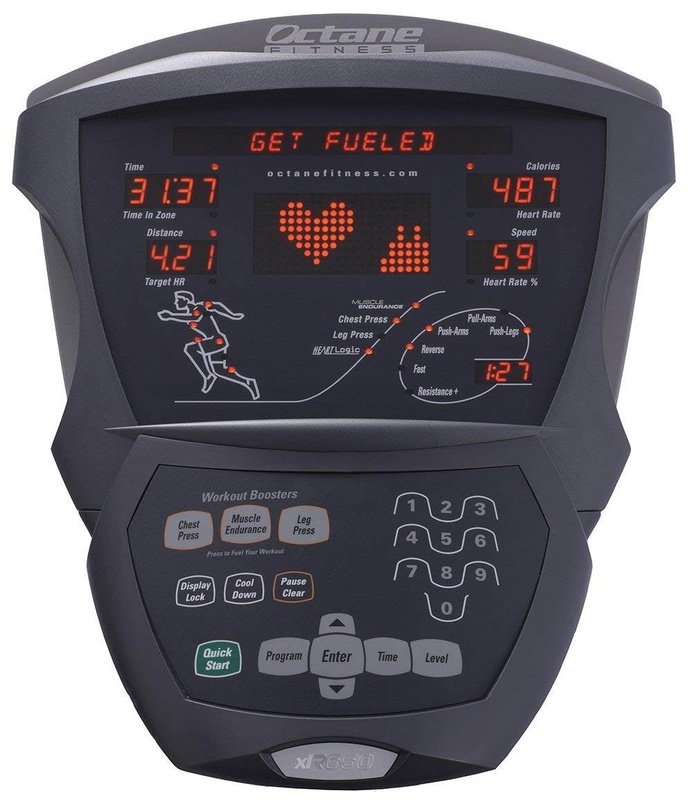 Your heart-rate is displayed on the LCD console along with a range of other motivating workout stats such as time, speed, distance, calories burned and resistance level. Both the Octane xR6000 and xR650 Recumbent Elliptical Machines are ergonomically designed and feature Converging Path moving handlebars for natural movement and elliptical-path motion soft-grip pedals. Look closely at the pictures and you’ll see a difference in the design of the moving handlebars, with the xR650 having standard handlebars while the xR6000 has multi-grip position handlebars so you can place your hands in different positions for comfort or to work different muscles. 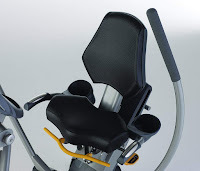 The Octane xR6000 and xR650 offer optional upper body lockout and both machines feature stationary foot pegs so you can rest your feet to isolate an upper body workout at any time. The Octane Fitness xR6000 and xR650 Recumbent Ellipticals are designed with a step-through frame to make it easy to mount and dismount the seat. The seat itself features a large cushioned base with backrest and is designed to sit at a 45-degree angle to help ensure correct posture as you exercise, opening the torso and maximizing the use of the hip muscles, whilst supporting the lower back. The seat can be easily adjusted for different users with 20 height adjustments and 5 tilt adjustments. 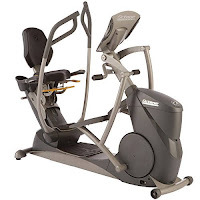 Additional features of both the Octane Fitness xR6000 and xR650 Recumbent Elliptical Trainers include transport wheels, dual water bottle holder/accessory holder (at side of seat), integrated media shelf on console, and a user weight capacity of up to 400 lbs. The Octane xR6000 also has a couple of extra features which the xR650 does not have - convenient fingertip controls on its stationary handles and a 3-speed cooling fan on its console. The features and specifications listed above speak for themselves – these Octane recumbent elliptical machines are high quality, durable and suitable for commercial use. They operate extremely smoothly and quietly and offer a super effective workout in a low-impact way that’s suitable for people of all ages and fitness levels. Recumbent exercise machines in general are recommended by many physiotherapists to help patients rehabilitate after leg, knee and hip surgery (always check with your medical advisor!). In addition, recumbent machines are one of the easiest forms of exercise to stick with in the long-term to reach and maintain your fitness goals. The Octane Fitness xR6000 and xR650’s unique build and exclusive technology put these recumbent ellipticals in a class of their own, offering a highly effective yet low-impact workout that can include HIIT, intervals and more. Whilst not cheap, the old saying “you get what you pay for” is certainly the case here and these machines are well-worth the money for their durability, quality, ergonomic design and great range of exclusive features. N.B. It’s advisable to consult your doctor or health care professional before undertaking any new exercise regime. *Prices/discounts/shipping indicated correct at the time of writing/publishing and may be subject to change anytime. E&OE. Comparing Inspire Fitness CS4 vs CS3 vs CS2.5 Cardio Strider, What's the Difference?